Home Inspiration	Ideas to customize your place cards. 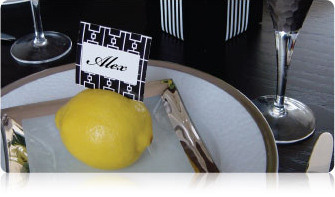 Customizing your place cards is one of the best DIY projects to engage in. Not only will you save money making your own cards, but you will have a lot of fun doing it. It is a simple project that requires little time yet lots of imagination and creativity. Here are some easy to make suggestions that can turn your place cards into a hit! When thinking on the stationary and paper you want to use, think on some aspects first. How thick do you want your cards to be? If they are going to be placed on top of grass, for example, you do not need very thick cards. If you will be placing your cards on top of glass, however, you might want to have thicker cards to make sure they stand up properly. Also, choose the size as well as the color that best matches your event. Include your monogram or wedding theme onto your cards. This is the easiest way to customize your cards inexpensively and to attain that special look that it is so you. Make sure to get the help of friends and family when doing this project. If you are using a special stamp or stencil for your invitations or other stationary, make sure to use it here too! If not, stickers or printed cards are also good options to go for. Use small flowers such as pom poms or spray roses for your cards. Gluing one of these small blooms to your cards will give them a very elegant, colorful touch. Go for long lasting flowers that do not require a lot of water for survival. Poms are perfect for this project because they are very long lasting, can live a day without water and come in bright, beautiful colors. If you would like a bigger bloom, daisies and spray roses are perfect for you. Remember to care for your flowers once they arrive and to glue them to the cards one day before the event. After the flowers have been pasted into the cards, keep them in a dark, cool place for maximum freshness. If you prefer a vintage look, you can dry the flowers first and glue them when they are completely dry. You can also add scent to your dried flowers for a special detail. Excellent flowers to do this are statice, baby’s breath and spray roses. Nontraditional items can be used as a holder for your cards. You can use lemons, limes or oranges for a mod wedding, or fresh flowers such as hydrangeas and gerbera daisies for colorful affairs. If you prefer a more elaborate element to add to your table, mini DIY flower vases are one of the best choices. Place cards can be a fun DIY project to engage in. Brainstorm a little, get your DIY ideas flowing and start creating them! All of these types of wedding flowers and wedding supplies can be found at www.Fiftyflowers.com.